Its been a wild week with strong wind, heavy rain and flooding all over the country. This has heavily effected the flight schedules in Marlborough this week. One notible change on Friday 1-Aug-08 was the cancellation of NZ2123/124 BHE-CHE-BHE due to the aircraft being stuck in Wellington. It positioned into Blenheim as NZ2915 at 0910. NZ8960 itself a positioning flight from CHC-NSN was cancelled and instead NZ8962 operated CHC-BHE-NSN arriving at 1020, to clear the passengers stranded in CHC. Also noted operating during daylight hours was Airwork (NZ) Ltd - AirPost Fokker F27 ZK-PAX operating under its usual BHE-WLG-AKL Post20 call sign operating several flights to WLG, AKL and CHC to move mail around that was stranded due to the closure of SH1, and other weather related roading problems. To show how much rain fell in Marlborough on Weds 30-July-08 the below photo shows the stream at the end of runway 24 at Woodbourne. 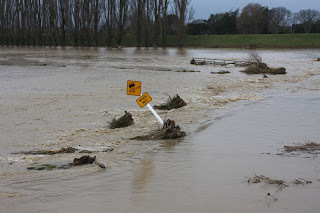 In the 20 odd years I've been in Marlborough I only remember seeing water in it maybe twice and never ever this much - to show its strength the bridge shown is usually paralell to the road next to the road bridge not several meters down stream facing the same way as the stream!